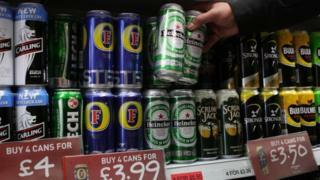 The maximum recommended weekly intake of alcohol can be bought for £2.52, according to a new survey. Alcohol Focus Scotland's study came as judges heard legal arguments about the Scottish government's plans to bring in a minimum unit price for alcohol. The charity checked the prices of cider, vodka, lager and wine in supermarkets and convenience stores in Glasgow and Edinburgh. It worked out that some booze could be bought for 18p per unit of alcohol. Legislation for a minimum price of 50p per unit was passed by MSPs in 2012. But the Scotch Whisky Association (SWA) launched a legal challenge to the policy and it has still not been introduced. Why does Scotland still not have minimum pricing? The Scottish government, health professionals, police, alcohol charities and some members of the drinks industry believe minimum pricing would help address Scotland's "unhealthy relationship with drink". Under the plans, the cheapest bottle of wine (9.4 units of alcohol) would be £4.69, a four-pack of 500ml cans of 4% lager would cost at least £4 and a 70cl bottle of whisky could not be sold for less than £14. The SWA has argued minimum pricing would discriminate against poorer drinkers, and was beyond the power of the Scottish government. The Alcohol Focus Scotland study found cider topped the list for getting the maximum alcohol for the cheapest price. It said one three-litre bottle of cider, at 7.5% alcohol by volume, cost just £3.99. The government's chief medical officer recommends the maximum weekly intake of alcohol is 14 units for both men and women. At this price, the weekly limit would cost just £2.52. It said cheap cider was sold by all the shops and supermarkets visited, with two and three-litre bottles typically selling for between 18p and 24p per unit. Alcohol Focus said legal challenges to the government's policy over the past four years had "undoubtedly cost lives". Lawyers representing the Scotch Whisky Association (SWA) and the government will appear at the Court of Session as the latest court proceeding takes place. They will debate a European Court of Justice (ECJ) ruling last December that minimum pricing may breach EU rules on free trade. The case was taken to the ECJ in Luxembourg, where judges ruled that the minimum pricing plans would restrict free trade. They instead recommended the introduction of alternative tax measures to increase the price of alcohol instead of a minimum price per unit. But, the European judges said it was "ultimately for the national court to determine whether measures other than that provided for by the Scottish legislation, such as increased taxation on alcoholic drinks, are capable of protecting human life and health as effectively as the current legislation, while being less restrictive of trade in those products within the EU." Three Scottish judges - Lord Carloway, Lord Brodie and Lord Menzies - will use the European ruling in their deliberations at the Court of Session. They will have to examine all of the evidence to help them decide whether improvements in public health could be achieved by other means, such as increasing tax rates. The issue is due to be debated over the next two days, with the judges expected to deliver their findings at a later date. But regardless of the Court of Session ruling, a further appeal to the UK Supreme Court by either the Scottish government or the SWA is thought to be almost inevitable.